As usual with my reports – skimming is recommended. Reading all of it is next to impossible – brevity is not my forte! 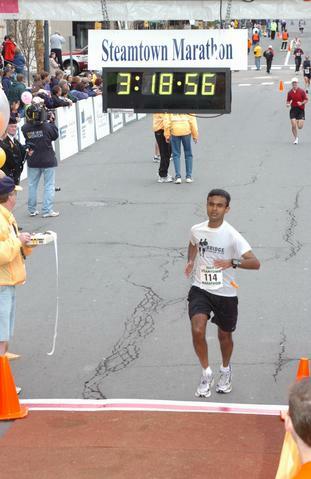 When it was time to pick my goal marathon for Fall ’05, I had a hard time deciding between Steamtown and Chicago. The clincher appeared to be the awesome things I heard about Steamtown from folks. In addition there are so many marathons out there to experience that I don’t want to run any marathon (except Boston) more than once. When I do run Chicago I want it to be with a competitive entry (ok maybe if it looks like I can’t get there I’ll give in). The weather forecast for race day weekend was looking totally peaceful and perfect before out of nowhere the remains of a tropical storm got in buckets of rain. I drove down from Boston to NY on Friday and stayed there overnight. I had planned to get in my pre-race day run in the morning but when I woke up I somehow convinced myself that a couple of extra hours of sleep would be more useful than a run in pouring rain. I am yet to figure out the ramifications of this decision (ref: to mile 1-3 vs rest of the race). As I drove to Scranton in the pouring rain, I felt bad for the folks running Hartford. It was getting difficult just to drive in these conditions. I could not even think about running a goal race in this. Once I got to downtown Scranton I proceeded to immediately get myself lost (I don’t only get lost when I am running). The good thing was that soon I had pretty much covered the entire downtown. Then I saw a high school. I figured there could not be too many high schools in a small city like this and this had to be the location of the expo. It was deserted with just one sign “Steamtown marathon showers”. I knew this one was a small marathon but why was I the only one picking up their packet? Ok, then I went to the right high school and was really happy to see people. Shannon and her entourage (as Glo puts it) came in at exactly the same time. The expo was small as expected and the race packet did not have much. One item did catch my attention though – a coupon for a free Big Mac with a purchase of fries. Apparently, the management at MCD has noticed an untapped market in marathoners. Shannon signed up for Phoebie Snow division which was very easy to get into but I was told that I had a long way to go before I could make it into the Big Boy or Iron horse divisions. I cast a forlorn look at the MCD coupon but Shannon told methat it would take several Big Macs before I could get anywhere close to 220 pounds. At 6pm amidst the pouring rain I made it to the ski-lodge for the pasta dinner with Glo, her boyfriend, Shannon, her entourage, Chris and his friends. The live music was nice but I could swear it seemed like the nice lady was singing the same set of songs over and over again (Glo told me this was not the case and I just had pre-race jitters). Given that I had spent the previous day going all over downtown Scranton I easily found a spot a block from the finish line. The ride to Forest City was interesting with folks talking about their race adventures. It looked like most of the folks running this were serious about their running and were well-trained. As we got off the bus there were high-school cheerleaders welcoming the runners! It was pretty chilly out there so being able to stay in the warm gym waiting for the race to start was awesome. There were no lines at the porta-potties either (I normally spend a significant portion of my pre-race time waiting in these lines)! Volunteers asked me atleast three times if I wanted a bottle of water – heck at other places I am lucky if I can get any! The volunteers and the way the locals support this marathon is one of the things that stood out for me. As I went down the steep hill my shins and pretty much my lower leg started hurting. I was worried that if this got any worse a DNF would be unavoidable. At the beginning of this mile Chris caught up with me. He was aiming for a 3:30-3:35 and was ahead of goal pace. We ran together for the rest of the mile. This mile marker was clearly off (based on my GPS). So probably the previous mile was long. Chris decided he was running too fast and decided to ease up. I realized that my legs were no longer aching (and never did again)! Perhaps Chris sent some magic vibes my way? I am now happy to be running Steamtown. My muscles had warmed up. Perhaps if I had got in my pre-race day warm-up run, the first three miles would have been better. However can a price be put on the extra sleep - I was better rested for the final miles? We enter Downtown Carbondale. The crowds there are amazing! All through the race the locals were so enthusiastic – they know how to support their runners! Its better having just a few of these folks cheering you than a whole bunch of passive people. I hit the half way point on track for goal 1 but if I needed to hit goal 2 I would need to negative split. Clearly the second half of the course was tougher than the first half with the late hills. However, I had been feeling good that my average HR for all the preceding miles were less than or around the mid-point of my target range. Now that I look at my HR splits, sub-consciously I picked things up after seeing my half split. Ironically, during my last marathon at VCM getting to the half-way point had exactly the opposite effect. There I knew I would not be able to PR and it was the second ‘thon of a double so I dialed things down. We had hit the trails. The change of surface felt kind of odd but was a nice change. I distinctly remember crossing the bridge over the Lackawanna River. The scenery was awesome! From the half-way point to the end of the race I constantly passed runners – that felt good (and I did not get passed by anyone!). We got out of the trail and back onto the hard surface. I did feel the change but after a bit things were back to normal. There was also a small out and back on this mile. This was neat since I got to see others in front and behind me. On this mile there was a section with wood chips. That felt bouncy, a little bit like running on grass. The race director in a post-race email joked that next year they’ll try to get quick-sand on this section (The several emails from the RD leading up to the marathon were pretty cool. He has a great sense of humor). My left quad started hurting for the first time on this mile. The downhills had to have taken some toll. I wondered how the final miles would pan out. I told myself that I was well-trained and well-prepared so I should be fine. I had run pretty much all my long runs as out and backs on the Boston course so I hit those hills twice during a run. My half marathon PR pace is 7:25 so it was nice to run faster than that on mile 21 of a ‘thon. I noticed that as the inclines became more frequent I was enjoying running with a group of runners, and when we reached the incline, they slowed down and I picked up the pace passing them. I figured that after the climb I could get my HR down. I got a cup of Gatorade and then poured it right into my eyes while trying to drink while running. A nice volunteer burst out laughing. As I squinted and ran I started laughing too. I think it must have looked quite funny. 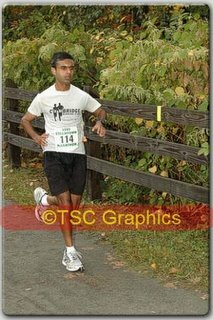 Hey, even through I am a slow runner, once I cross the start line I do not like stopping (if I can avoid it) till I reach the finish line)! I was looking for the Electric street hill during this mile. There were a whole bunch of inclines but of the kind that we had seen in previous miles. I had pictured climbing up an impressive imposing hill. I guess I was so focused on running that I kind of missed the real hill. This is my most “comfortable” (hey, comfort is relative) marathon finish to date. At no point did I feel the need to stop and for a change I did not fade during the last 10k. Considering the course, a 2:20 negative split was nice too. I loved this marathon experience. If I think of running any marathon twice this will be it. I got my medal and then began the normal post ‘thon hobble. I ran into Chris again – he had finished with a nice PR. I made my way to get the massage (I’ve noticed that these really seem to help). Before the race I was pretty impressed with myself for finding a parking spot a block away from the finish. After the finish I realized that I could not remember where I parked my car. So I hobbled past all blocks in the vicinity before I finally located my car. and not the 3:20 pace group. Should be a fun run – I’m getting excited!